In a saucepan over medium heat, combine butter, sugar, vanilla, and salt. Let butter melt and then cook, stirring constantly with a spatula (so the butter and sugar don’t separate! ), until mixture turns a dark amber, 12 to 15 minutes. (This can take closer to 20 minutes if you’re heat is not high enough. Increase the heat and keep stirring until the color turns. Don’t give up! If you’d like to use a candy thermometer for this step, attach it to the saucepan and cook until the temperature reaches 285º, or hard crack stage.) Toffee mixture should be dark in color and very thick. 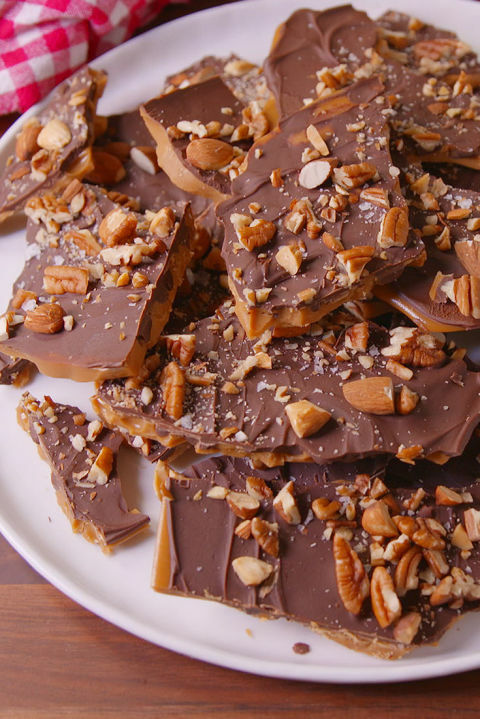 Pour toffee mixture onto a parchment-lined baking sheet and immediately top all over with chocolate chips. Let sit 2 minutes so chocolate begins to melt, then spread chocolate all over with a spatula to create a layer on top of toffee. Sprinkle all over with almonds and pecans (use chopped crumbs too for nice texture!) and flaky sea salt.